Everyone loves their dog. But many don’t realize that they can learn a lot from their dog. Without knowing it, their dogs can be their best teacher. If they follow their dogs ways, they will often find themselves becoming a better, more productive, and happier person. 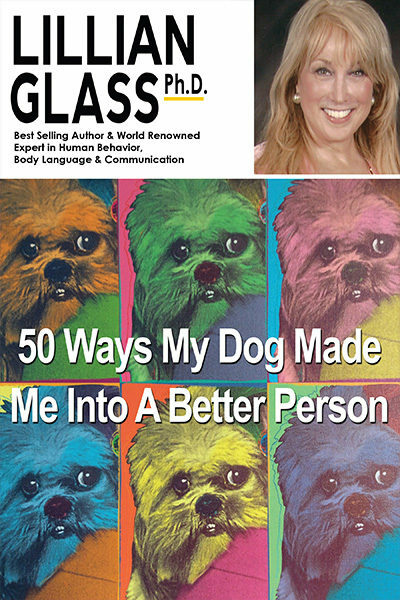 50 Ways My Dog Made Me Into A Better person by Dr. Lillian Glass. Real Love Is Mutual and Unconditional l, Love Makes You Fearless and Confident, Fi9nd Out Who’s In Charge and Be Nice to Them, Trust Your Instincts, Before You Make A Decision Smell It First, Too Tight A Leash Inhibits Freedom, Joy, and Creativity, and Always Keep Your Eye on the Prize.